A mission patch for the Mars Pathfinder mission in 1996. One of the major mission objectives was to deliver a microrover safely to the surface in order to study the surface composition. The microrover onboard was known as Sojourner. Rocks and soil were probed with an Alpha Proton X-ray Spectrometer (APXS), The name Sojourner was selected in a contest that was won by Vallery Ambroise, a 12-year-old from Connecticut. It is named for Sojourner Truth, an abolitionist and women's rights activist. Sojourner first appeared in print in the Bible in the first chapter of Genesis. It deals with the travels of Abraham; it means "traveler." Sojourner was powered with solar panels and a non-rechargeable battery, which greatly limited night time activities. When the batteries were depleted, it could not work at night. Its lithium-thionyl chloride (LiSOCl2) batteries only generated 150 watt-hours. The Mars Pathfinder Mission lasted from December 1996 to March 1998. It greatly surpassed its expectations by returning 2.3 billion bits of information, including over 17,000 images. pathfinder carried out more than 15 chemical analyses of rocks and soil, besides collecting data on the weather. Information learned through the mission suggest that, in its past, Mars was warm and wet, with liquid water on its surface and a thicker atmosphere. Depletion of the spacecraft's battery along with a drop in the spacecraft's operating temperature were believed to be why we lost communications with Pathfinder in October 1997. The mission far surpassed its expected 30-day lifetime. Pathfinder was surrounded by giant air bags for its landing. It bounced at least 15 times and up to 12 meters high before it came to rest. 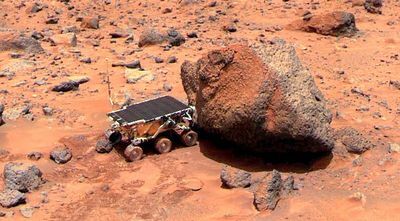 Sojourner rover taking an Alpha Proton X-ray Spectrometer measurement of the rock Yogi. In all the rover traveled 52 meters. -Running water during a warmer past in which liquid water was stable was suggested because rounded pebbles and cobbles at the landing site, along with other observations. Rounded rocks are usually formed in running water which wears off sharp edges. -An improved determination of the Red Planets' metallic core resulted from radio tracking of Mars Pathfinder. The core of Mars is now thought to be between 800 miles (1,300 kilometers) and 1,250 miles (2,000 kilometers). -Long a mystery, airborne dust was found to be magnetic, and maybe composed of the mineral maghemite, a highly magnetic form of iron oxide. It may be freeze-dried on the particles as a stain or cement. This finding is consistent with a water cycle that may have dissolved the iron from the crust. -Dust devils were imaged and measured with temperature, wind and pressure sensors. These tiny wind swirls may serve as a way of mixing dust in the air..
-Early morning water ice clouds were observed. ↑ Golombek, M., et al. 1997. Overview of the Mars Pathfinder Mission and Assessment of Landing Site Predictions. Science: 278, 1743-1748. ↑ Hviid S., et al. 1997. 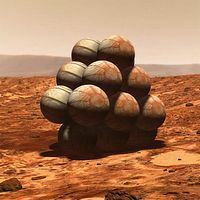 Magnetic Properties Experiments on the Mars Pathfinder Lander: Preliminary Results. Science: 278, 1768-1770. - Golombek, M. et al. 1997. 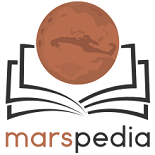 Overview of the Mars Pathfinder Mission and Assessment of Landing Site Predictions. Science: 278. pp. 1743–1748. -Smith, P. et al. 1997. Results from the Mars Pathfinder Camera. Science: 278. 1758-1765. -Hviid, S. et al. 1997. Magnetic Properties Experiments on the Mars Pathfinder Lander: Preliminary Results. Science:278. 1768-1770.